I went into this book based on the title alone. Accident. Season. 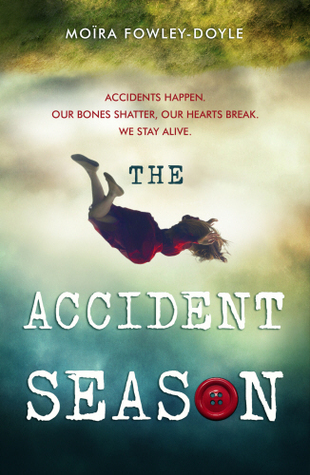 Two words that don’t go typically together, because accidents are usually random events and they aren’t seasonal. Hence, I jumped into this book. Needless to say, I am not pleased. Cara and her family are ‘cursed’ during a period every October in which they become extremely accident-prone. They clutch the railings of stairs, they pad the edges of tables, they wear extra layers of clothing to protect against potential injury and death. It happens so regularly during this particular time of year that Cara and her family accept this as a normal part of life. That is, until one day, Cara discovers a childhood friend eerily present in her family photos. She recruits her tarot card reader friend Bea to help her with her friend’s mysterious disappearance, as well as the source of her family’s accident season. Sadly, the first 100 pages of this book are a complete waste. There is literally NOTHING that happens here to compel you to give a damn about any one of the characters. Luckily I picked up on this around page 25 and skimmed my way to the middle, and boy am I glad I did. I didn’t miss much. Miss Dowley (bless her heart) muddles this book with a lot of vivid imagery–broken bridges, old bookstores, a mysterious typewriter, etc. There is a gothy kind of appeal here…it’s lush and dreamy, but it does absolutely nothing for this book because you’re too busy trying to figure out when the hell the subplots (the disappearance, the accidents, etc) are all going to come together in any kind of meaningful way. It’s terribly confusing, and confusion while reading fiction is never a good thing. And yes, for those that ask: I’ll take a bad book (bad writing, weak characters, bad everything) over a confusing book any day, ok? There is a romance in this book (it’s YA, people!) but even that is, umm…confusing, weird, awkward, strange. I won’t say any more about it. Matter of fact, I won’t give away any details here, because honestly, it doesn’t benefit me to spoil it for those who really want to read it. Like really, what would be the point? It just sucked. So sad that you don’t like this book. Personally It was my favorite!